Above scenario will also correct for mass transfer from Setup | Data Management | Mass Transfer Records | Transfer Accounts. But, if you change Account owner through API, or API tool such as: Data Loader, only the Account Owner will be change, it will not change owner of Contact, Opportunity and other objects related. How do I change Account Ownership using the Data Loader? How to Change the Record owner using the Data Loader? Account Team Member and Account Share only available in Enterprise and Unlimited edition (included Developer edition). An account team is a team of users that work together on an account. You can add a user into Account Team manually from Account Team related list in Account Page Layout. After click Add button, you can specify Account Access, Contact Access, Opportunity Access, Case Access, and Team Role. If your default sharing in OWD is Private for that objects, you will see Private, Read Only, and Read/Write option in the picklist. You can add up to 5 users every time add team member manually. But, if you need to add users into hundreds of account team member, manual process is not fun. So, here is the solution. Use Data Loader to mass create AccountTeamMember records and AccountShare records. Note: creating this record will not allow user added into AccountTeamMember to access Contact, Opportunity, Case if the sharing setting is Private. TeamMemberRole value can be different with values defined in Team Role. Purpose: it will show user added into Account Team related list. You can set Private, Read Only, and Read/Write in above fields optional if default sharing in OWD is set to Private. Note: user added into Account Share will be able to access Case, Contact and Opportunity records with Read Only or Read/Write permission, even it is not shown in Account Team related list. 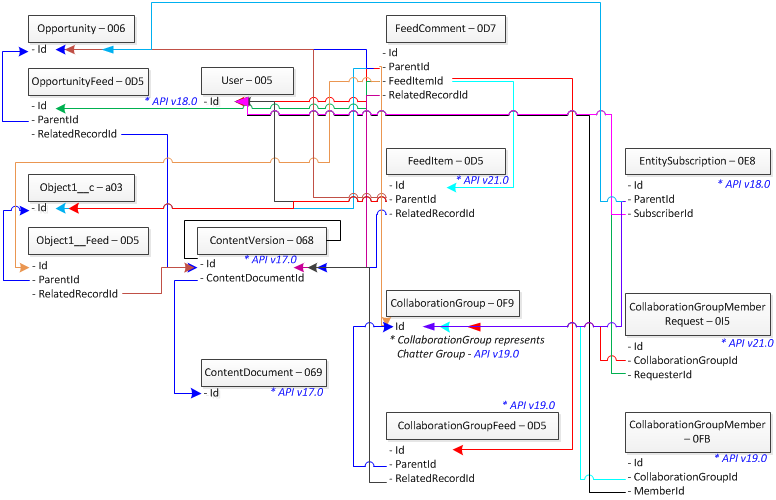 Here is more information on mass create manual sharing rules with the Data Loader, click here. We can mass upload / insert data to Salesforce easily using Data Loader or other API tool. But, if we get the data in Excel file with non-English characters, non-English characters will be come ? ?, This is happened if we save the CSV file directly from Ms Excel. To upload in non-English characters correctly, the file should be in UTF-8. Here step by step needs to be done, to avoid Ms Excel limitation in process non-English characters. 4. Open the unicode text file using Microsoft Notepad. Some characters can appear as a box. This is because Notepad cannot display some unicode characters, but you can ignore it at this point. 7. Give a file name and change Encoding: to "UTF-8"
9. Change the file extension from "*.txt" to "*.csv". The file icon should be changed to MS Excel now. If it is not changed, check Windows Folder options. (Windows Start menu > Control Panel > Folder Options > View tab > uncheck "Hide extensions for known file types"). This will show the file extensions. Try changing the file extension again. 10. Open this CSV file from Excel and verify if the data is okay. *** If you find any problem in this step, you should NOT save the file from Excel. It will cause the encoding problem!! Just check the data only in Excel. If you see a data problem at this stage, fix the data from the original spreadsheet and repeat the steps again. Or, you can change it from Notepad but should ensure that the file is saved as UTF-8 format. You can download sample csv file with non-English characters saved in UTF-8 encoding here. Make sure you are in office network (including VPN) and try to login yourself. If not working, check with your peers of SSO expert, maybe server down or some other issue. If you can login with SSO, check the user detail and make sure Federation Id is enter correctly. It is a good practice for admin to run a report to list down all Active users with their Federation Id information. But.... we cannot find Federation Id field in available field using standard Users report type. To confirm, click "Edit Layout" button in Fields Available for Reports, you should see "SAML Federation Id" is there. 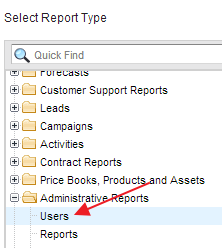 Create normal report and select report type created in step 1 from correct report folders. You should be able to see SAML Federation Id in available field fro report. A user come to me today asking how to create a report on Account with Account Name contain " (double quote) ? Hmmm... it seems easily, just type " in report filter criteria using CONTAIN. But, it will not work, since " is consider as string function. Checking to Salesforce community? @SteveMo response me with excellent answer. Type ' + " + ' (read: without + sign), instead of using " or \" (escape sequence in SOQL). But I realize, after the report save and open the report again, the value for filter '"' is gone. Not sure if this Salesforce bug? But, I believe this is something Salesforce need to look into. In my previous blog, I give overview on Chatter Feed, how to query it, and how it is structured within Salesforce. In this blog, I would like to give overview on Chatter Comment. Using any API tool, we can query and extract all feed comment into csv file. The API object name is FeedComment (record prefix with 0D7). FeedItemId is Chatter feed that comment tag to, and ParentId show the comment is tag to what object, it can go to Opportunity, User, Chatter Group and etc. More information on chatter comment here. 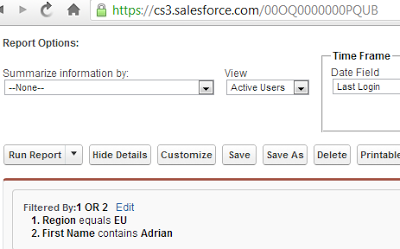 Salesforce admin can enable Chatter feed tracking on Salesforce object, include custom objects. 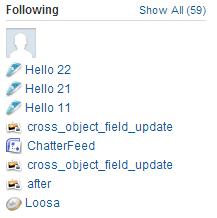 Select object to track and tick "Enable Feed Tracking", you can select up to 20 fields. In the background, once an object is enable for feed tracking, Salesforce will create new object end with suffix Feed (for Standard object) or _Feed (for Custom object). This is available in API version 18.0 and later. Another object storing all feeds is FeedItem, this object avaiable in API version 21.0 and later. This query will return all feeds tag to any objects. 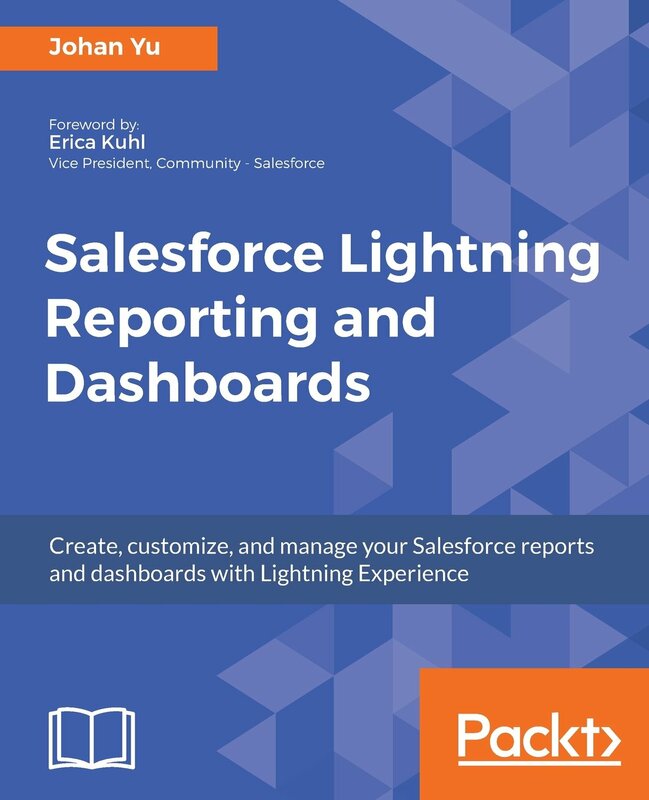 Can we have a report of data trending in Salesforce? Hmmmm, Salesforce only report current data? But, is there a way to store historical data so we can use it for reporting? 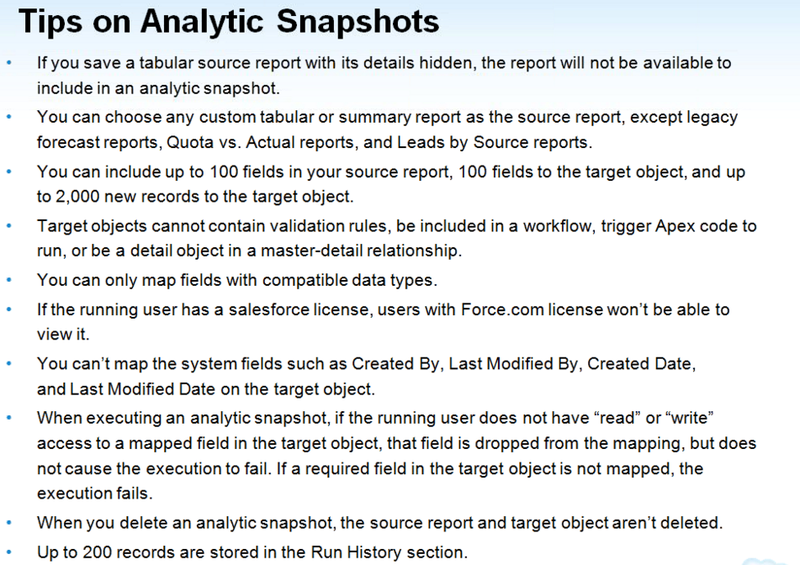 Yes, if you are using Salesforce Enterprise or Unlimited edition, you can configure Reporting Snapshot to store historical data, but do not expect old historical data will be available before configured reporting snapshot. Only historical data for specific reporting snapshot will be available after configured and run properly. Users with "Manage Reporting Snapshots" permission able to create and configure reporting snapshot. Each edition have a limited number of reporting snapshot can be created, so used it wisely. 1. Create a source report, this report type should be only tabular or summary. Please note, the number of records will be created in target object will be the same with how many records in report result. For a tabular report, it will be one to one, and for a summary report, it will be by group summary or grand summary. If you choose grand summary, it will always create only 1 record in a target object. 2. Create a target object, this would be a custom object in Salesforce. Make sure the target object must not be included in a WORKFLOW. 3. Create fields in the target object, by default reporting snapshot will give us 3 information that we can capture into fields in target object: Reporting Snapshot Name, Reporting Snapshot Running User, Execution Time. Try to create field name similar or represent data will be created from source report. 4. 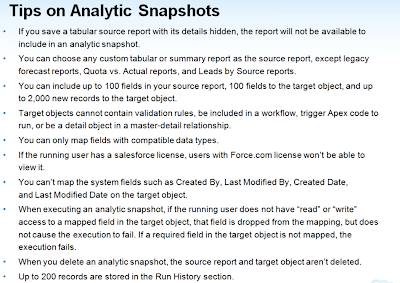 Create the reporting snapshot, from Setup - Data Management - Reporting Snapshots. You need to enter: Reporting Snapshot Name (Job name), Running User, Source Report, Target Object, and Description (optional). 5. Map Fields from Source Report to Target Object, in this step, if your source report type is summary, you need to select grouping level. Applicable source report field will be available for each target object, it is based on the field type. 6. Create Schedule, you can set to email reporting snapshot to yourself, other user or to a group, and select frequency on daily, weekly and monthly basis. Available start time will be shown on this screen. After the reporting snapshot has been run for a few times, you can build a report to show the trend. Lastly, you can monitor ALL Reporting Snapshot in your Salesforce instance from Setup - Monitor - Scheduled Jobs. Create a new View and filter with Type = Reporting Snapshots, this will show the Job Name, Submitted By, Started, and Next Scheduled Run. If the Next Scheduled Run is blank, this means that 'Reporting Snapshot' is no longer active. In the past Reporting Snapshot is known as Analytics Snapshot. Dynamic dashboard is great to enable each user to see the data they only have access to or their team have access to, without the need to create separate dashboards using a fix user "viewing as". But, each organization only have up to 5 dynamic dashboards for Enterprise Edition and 10 dynamic dashboards for Unlimited Edition, additional dynamic dashboards available for purchase separately. 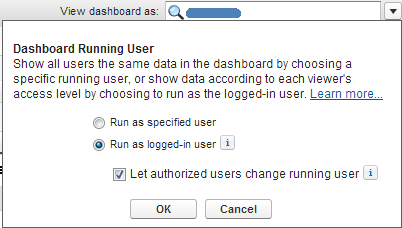 So, it important for system admin to know all dashboards configured as dynamic dashboard. Let us go through how to list down all dashboards configured as dynamic dashboard. Reference: How to count dynamic dashboards (run as logged in user) that are used and can we purchase more? Manual sharing record in Salesforce is easy, user just click Sharing button to share a record to Public Groups, Roles, Roles and Subordinates and Users, only when 'Organization-Wide Defaults' sharing is set to Private or Public Read Only for the object. By clicking Sharing button, you’ll see who can access that record and why (sharing rule, group, role hierarchy, manual share etc). The Sharing button allows users to extend the sharing of a record. However, Sharing button only displays when appropriate. Sharing button will be available when your sharing setting is either Private or Public Read Only for an object or related object. For example, Sharing button may appear on Account even though sharing model for Account is Public Read/Write, if your sharing setting for Opportunity is Private or Public Read Only. Sharing button may not visible for particular user, while other user able to see that button in the same page layout. Some may think, user not able to see the button because do not have permission in the profile assigned, that is not correct. As you see, users with Read/Write permission is not in the list above, therefore they will not see the Sharing button. Lastly, you cannot manually share a contact which not linked to an account. Reference: Why can’t I see the Sharing button on a record? It is easy to build report in Salesforce using Report Builder. Any user have 'Create and Customize Reports' permission able to create report. 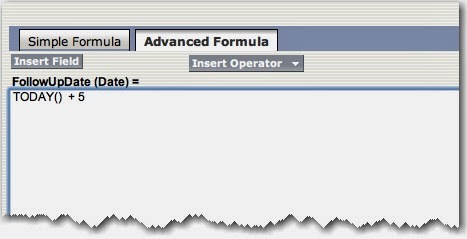 User also able to add filters using Add filters button or just drag field to filter area, included to add filter logic to use AND, OR logic combination. Once save, all the filters will be stay in the report to be used by other users. Salesforce.com report allow users to schedule reports run and deliver to their email or a group of users. It is very simple and with just a few clicks and user can set it up. This feature only available for user with Scheduled Reports permission enable in their user profile or user with added Permission Set contain Scheduled Reports permission. 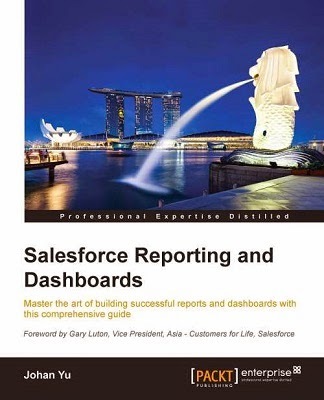 But, there is maximum of reports can be scheduled for each organisation depend on their Salesforce edition use, from Professional, Enterprise and Ultimate. For more information on the limitation, look here. Because of this limitation, system administrator need to know all reports is scheduled. It is very take time if you would like to check each report if you have hundreds or thousands of report in your company. Salesforce profile a simple way to check scheduled reports if you are system administrator or users with permission View Setup and Configuration. To see all scheduled reports for your organization, click Your Name | Setup | Monitoring | Scheduled Jobs. Please note that in that section you will see all the scheduled jobs (dashboard refresh, data export, etc). However, you can simply create a list view in order to display only jobs where Type EQUALS "Report Run". You can add in the filter for Next Scheduled Run not equal to <blank> to show only active schedule.